An investigation conducted by the Associated Press has found trace levels of pharmaceuticals in drinking water supplied to 46 million people in two dozen major cities in the U.S. It is estimated that at least 271 million pounds of pharmaceuticals have been released into waterways that supply drinking water. Some of the pharmaceuticals found include antibiotics, anticonvolsants, mood stabilizers and hormones. 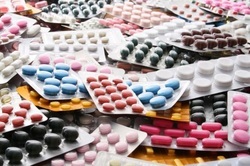 Over-the-counter (OTC), basic drugs have also been detected. Including Caffeine, Nicotine, Acetaminofen and Ibuprofen, two common pain relievers, Benzocaine and Lidocaine, local anesthetics used as topical pain relievers, Diphenhydramine (Benadryl), used to treat motion sickness and allergic reactions and Dextromethorphan, a cough suppressant. Including Carbamazepine, used to treat nerve pain and bipolar disorder, Primidone, used to treat seizure disorders and Diazepam (Valium), used to treat symptoms related to anxiety disorders. Including Amitriptyline, used to treat symptoms of depression and depressive disorder. Including Triclosan, an antibacterial and antifungal agent used in a wide range of consumer products, Ciproflozacin HCl and Erythromycin USP, used to treat or prevent certain infections caused by bacteria, as well as Sulfamethoxazole and Trimethoprim, commonly used to treat urinary tract infections, ear infections, bronchitis, traveler's diarrhea, and shigellosis. Including Progesterone, used in hormone replacement therapy and as part of infertility treatment in women. Including Diclofenac Sodium, Naproxen Sodium, Mepertine, Codeine and Morphine.